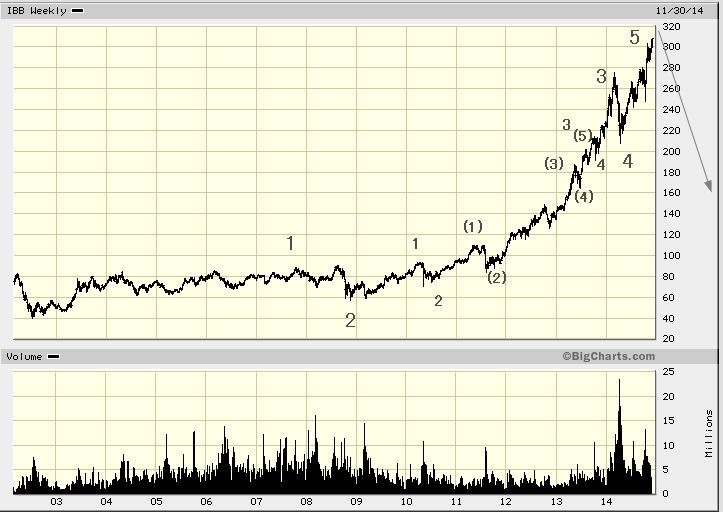 We have been wrong on this ETF before, but the count is now a perfectly clear 5-waves up sequence. In any event the chart stops at $320 so the stock cannot go any higher! This ETF consists of 125 different pharma and bio stocks, most of which you have never heard of. It earns a whopping 0.07 % per annum dividend (you have to own it for 30 years to get the same yield as you do in one year on a ten year bond). 39% of the stock is held in short positions so we are not alone but we do not suggest going short. We would rather buy a put. A 275 strike , March 2015 is going for about $10 and could, repeat could, easily be worth 10 times as much. Be prepared to do this a few times or alternatively start with a longer option. The expression “If at first you don’t succeed, try ,try again” was first coined on the Amsterdam exchange in 1632 in the context of the cherry options trade, where more than 31 different varieties traded as “privileges” as they were then called.